Barcelona, Spain. 28 April 2015. 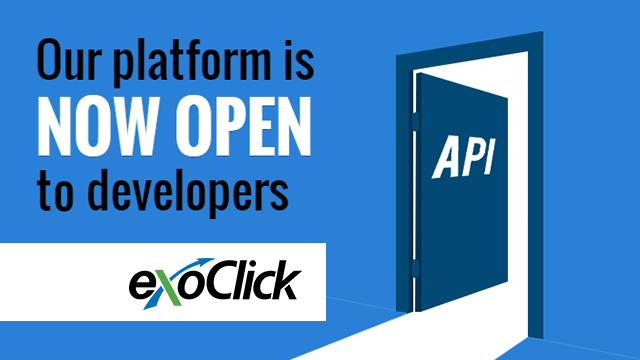 ExoClick, the innovative ad network, today announced that it has opened up its platform to developers, clients and partners with the launch of v1 of its brand new API. This version 1.0 of the API allows advertisers and publishers to fetch all of their statistics that are currently available in the Admin Panel. Advertisers can pull statistics for browser, carrier, category, country, date, device, hour, language, operating system, site and variation. Advertisers can also pause and resume campaigns. Publishers can pull statistics for browser, carrier, category, country, date, device, hour, operating system, site, sub-id and zone. Additionally there is a ‘Collections’ category which allows clients to pull groups of statistics covering browsers, carriers, categories, countries, devices, languages and operating systems. Developers are invited to incorporate the API and code into their own software to develop powerful applications such as their own bespoke analytical software, plug ins or the creation of Clients for different programming languages. ExoClick has developed a PHP Client to expediate integration of the API which can be downloaded here. The APIs interface is super friendly and fast to use. Simply set the parameters and press the ‘Try It Out’ button to automatically generate code. There is also a comprehensive user manual which additionally contains examples of PHP code for various functions that can be quickly copied to ensure fast workflow. Version 2.0 of the API, which will be released in the coming weeks, will give clients the opportunity to implement programmatic advertising and automate tasks for total programmatic control over their campaigns. ExoClick has created a dedicated developers page on their corporate website that contains links to the API and its documentation.